Accessories: alphabet stickers (dollar store); scallop & circle punches, Image: Stazon, watercolour pencil crayons, & Crystal Effects. Scallop: corner-rounder (SU retired), Hand-held hole punch 1/16 inch, Stickles (Arctic Ice); "You" definition tab: Marvy Giga square Scallop punch, clear e.p., Not Quite Navy craft ink, tiny gems (Michael's); Wee flowers: Three for you punch, fresh favourites eyelets, silver cording. "Feel Better" sentiment is computer generated & punched with the word window punch. give her my best. both feet ouchy mama!! 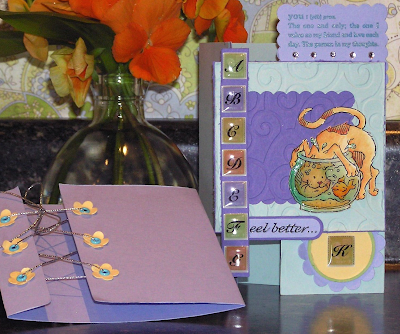 Hope you Aunt is feeling better soon, this card is so cute that is such a great image, love the layout. Love the stamp, great card as usual. Wa Wa, I can't find stickles in my local stores! The fish bowl "shine" is fab. Way cute image! Sweet card for your Aunt, I hope she has a quick recovery! This is sooooo super cute! Cute and fun...love the glossy kitty! Hope your aunt is feeling better soon. Adorable card! Cute cat for Kat. She'll love this!! I like the colour choices. I had fun tonight at stamp club. You are too generous with us! You rock!! So cute! My best to your Aunt! This card makes me feel good - even if my feet don't hurt!